One of the more common comments I get is, "I really need a two-seater. Is there a two-seat Fly Baby?" The answer is yes...and no. Pete Bowers did not design a two-seat Fly Baby...although he eventually developed a whole new two-seater called "Namu II".. If you go to page 9-3 of the plans, you'll see Pete's discussion of what he calls "The Two Seater Problem." 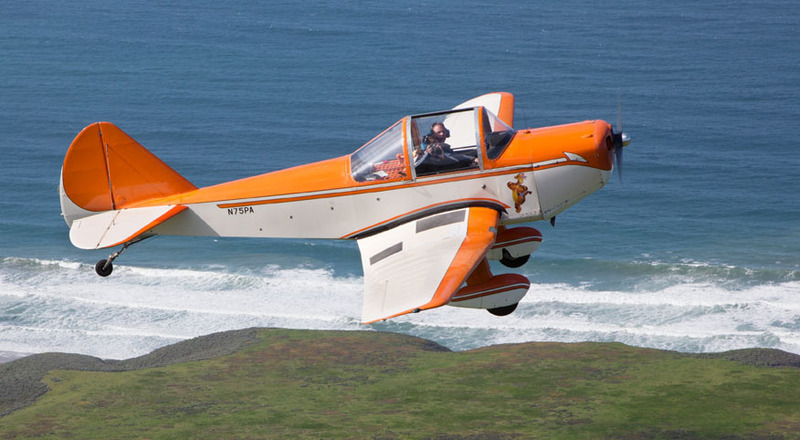 His opinons can be summarized in his final paragraph: "The designer stoutly maintains that the costs of converting FLY BABY to a two-seater far outweighs any anticipated advantage. You just can't make anything but a mediocre two-seater out of a good small single-seater..."
However, over the years, several people have adapted the basic Fly Baby design to be able to carry a passenger. The easiest way is to widen the fuselage to make a side-by-side two-seater. This has a big drag disadvantage, in that you now have a wide, open cockpit. In addition to the drag, there's a lot more airflow disturbance over the tail The best way to handle that would be to put a raised turtledeck and a canopy on it, like Art Blodgett did. Here's what Art has to say: "I liked the looks and simplicity of the flybaby design but wanted a two place aircraft. The fuselage is 40 inches wide at the cabin, the horizontal tail surface span was increased to 10 feet, and the vertical tail span increased 12 inches. I left the wing design and dimensions stock as per the plans. The landing gear legs were made wider by an inch and reinforced with 4130 tubing. The plane was built with a full gyro panel and electrical system. the engine and prop are from a 1964 Cessna 150. (Continental 0-200 A)....My empty weight ended up right at 900 lbs and I've set the gross weight at 1350 lbs." Note that Art is operating at a gross weight almost 400 pounds higher that stock. This, of course, reduces the ultimate G-capability of the airplane, unless some changes have been made. In the plans, Bowers says you can retain the 3/4" spars, but you should go to 5/32" bracing wires and the appropriately rated turnbuckles. Most guys, though, seem to want a tandem two-seater like a PT-19. This is a rather more difficult re-design problem due to the CG changes involved. I have heard of at least two that have flown, and one of them is fairly successful. The photo shows Victor Meznarsic's Fly Baby, which has been flying for twenty-five years or more. The front (passenger) cockpit on this airplane is rather cramped; the word I get is that it's not really big enough for an adult. As you can see from the photo, the main cockpit is moved aft...due to the taper of the fuselage, the shoulder room is a bit narrower than stock. Other problems? Well, with any tandem-seat airplane, the visibility from the aft seat (the PIC seat) is going to be fairly poor...you've not only got more fuselage in front of you, you've also got someone else's fat head. The rear seat is the PIC seat, as the front pit usually ends up right on the CG. It's easier to plan on the pilot sitting in the back seat all the time than accept the wide shift in CG when you carry a passenger. It's not to say the problems aren't solvable. 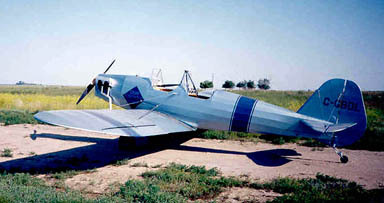 Bob Pearce of Saskatchwan based his two-seat "Skybaby 2" on the Fly Baby design. Many aspects were resized...for instance, the fuselage longerons are 1/8" larger, the spars are 1/16" thicker, and the wing is two inches broader in chort and about two feet wider in span. It's powered by an O-235, and with a full electrical system, has a 813-pound empty weight. The vertical fin was resized to handle the additional power (and the additional turbulence from the second cockpit, and a turnover pylon was installed betweent the two seats, something like a PT-19. There are a couple of other people working on tandem-seat Fly Babies. Dave Munday is sharing information on his web page, but I don't believe he's going to issue plans detailing the necessary changes. 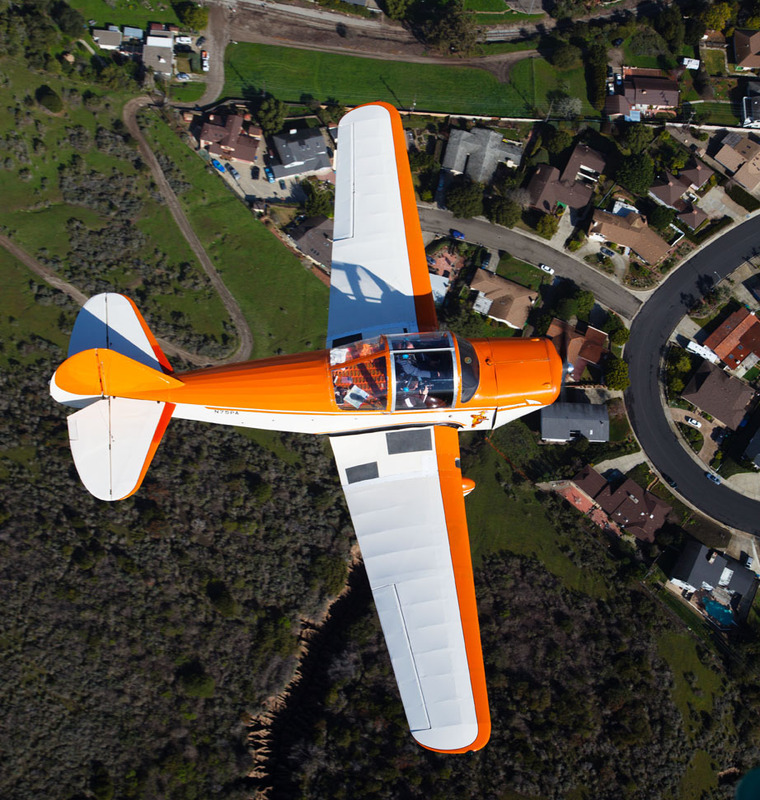 Eric Hevle of Hevle Aviation has flown his two-seat tandem version. The plane has a regular wooden fuselage, but steel landing gear. It will be used to check flight characteristics, etc. prior to the construction of a steel-tube version. Eric plans to build the steel-tube aircraft so that all the other Fly Baby components will directly attach...wings, tail feathers, etc. 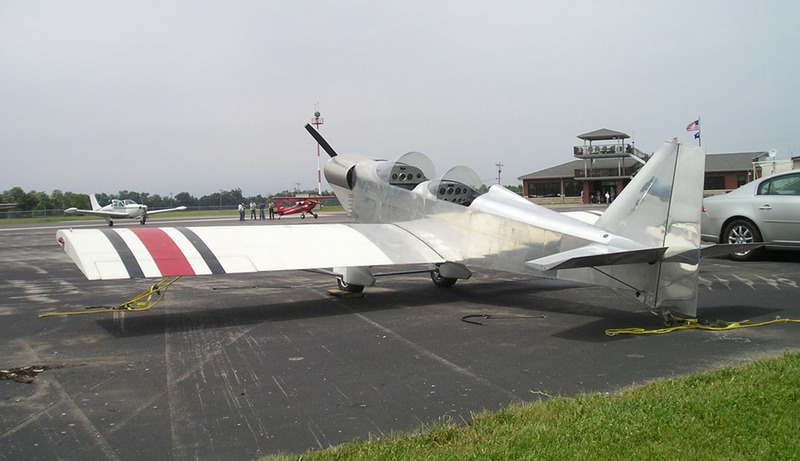 As you can see from the picture, it's flying with the Rotec Radial engine. This is *really* a nice looking bird. I flew this airplane back in April 2004...see my pilot report. In May, 2003, William David sent me some pictures of the "Crowbird," the two-seat homebuilt he's designed and is building. While inspired by the Fly Baby, the design is quite different from the ordinary Fly Baby...note the aluminum-angle fuselage. Pete Bowers didn't ignore the people who wanted a two-seater. He merely started from scratch on a new design. Dubbed "Namu II" (because it looked like the killer whale Namu in the Seattle Aquarium), it first flew in the late '70s. It used a surplus O-290G ground power unit, and featured side-by-side seating and inverted-gull wings. Just like the Fly Baby was large for a single-seater, Namu was big for a two-seater. The prop spinner was above my head, and it was a pretty big step onto the trailing-edge wing-walk. It was built just like a Fly Baby, though. I never flew Namu, but I did sit in it during the mid-80s. The cockpit was about the same width as a Cessna 150. Visibilily to the sides and back was good, though that tall nose did obstruct forward visibility for taxi. Compared to N500F, Pete has spent some time on the creature comforts; the seats were comfortable, and the cockpit sidewalls had upholstered trim panels. Namu didn't catch on. By the time Namu came out, people were building fast fiberglass airplanes like Variezes and hot rods like the T-18. I believe Pete sold a few sets of plans, but only one or two examples (other than the prototype) were built. One had an eye-catching paint job, though...it was painted like a killer whale. Here are some recent photos of Pete's original Namu, sent in by the current owner, Mike Madrid. Pretty attractive, in these shots. 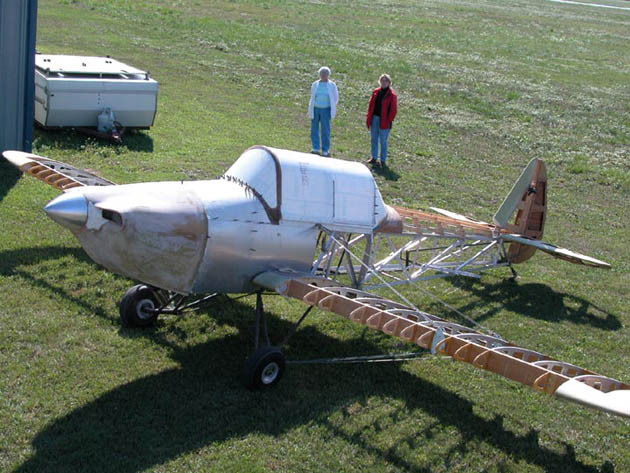 Don Taylor built a Fly Baby in the '60s, and since then, he's been building his own designs. He says they're often based on the Fly Baby...but all aluminum!. Here's his latest (summary of 2010)... an all-metal, two-seat Tandem version of the Fly Baby. It's powered by a Corvair engine, and has an empty weight of 891 pounds. The wings came from one of his earlier designs, Tinker Toy, which was featured in EAA Sport Aviation magazine in June 1974.